In 1946, Formula 1 was first formatted and presented to the world. The Commission Sportive Internationale (CSI - later renamed FISA and now absorbed into the FIA) defined Formula 1 as the first and finest category of single-seater motor racing, with the full implications of this to become effective in 1948. The name went through some permutations (there was Formulas A, B, and C for a while) - and it wasn't until 1950 that the racing category we know and love today officially became 'Formula 1'. The 'formulas' were based for the most part upon pre-WWII engine capacities, and the idea of breaking up the formulas was to provide a fair distinction between supercharged and 'normal' vehicles. Italy held the ground for much of this early era, with its engineering expertise coming distinctly to the fore. Alfa Romeos dominated, and Italian drivers did particularly well. The sport was still distinctly dangerous at this point - while teams took pains to insure their vehicles and their drivers against damage or injury, it was not so easy in this era to ensure the safety of the drivers. Crashes could and did prove fatal. However, it would be a long time before modern-style safety rulings came into play. After a dispute about funding, Alfa Romeo (a company owned by the Italian state) pulled out of Formula 1 in the early 1950s (largely, it seems, in order to spite its government). Opposition from then-unreliable rival machines and a motley cast of private drivers allowed Ferrari to (quite literally) take pole position - and it's been hard to shift the team ever since! The mid 1950s nonetheless saw Formula 1 stuck between a rock and a hard place, as the regulators had announced that they would shortly allow 2.5 litre atmospheric engines, yet with many teams squabbling and engineering funding scarce, it was evident that no team would be providing such a vehicle for the delectation and delight of the crowds. This led to the quiet adoption of Formula 2 regs for a couple of years, while teams ironed out their disputes and brought themselves up to scratch. Mercedes-Benz came to the rescue with some fantastically engineered vehicles and some truly talented drivers - but vanished in 1955, after the horrible crash of one of its vehicles at Le Mans - an accident which cost the lives of 82 people. Shaken and saddened, Mercedes left the field. In a similar spirit, four of that year's Grands Prix were cancelled. 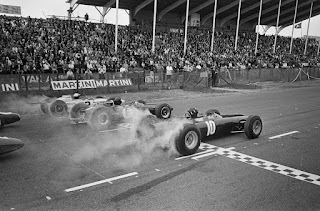 In the late '50s, race tracks were shortened, perhaps to account for the increased speed of the vehicles now approaching the starting line. 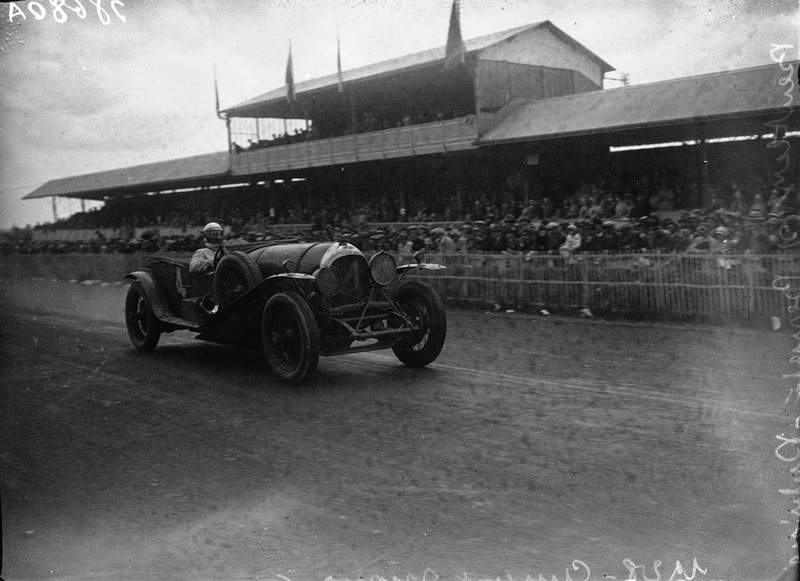 This was the era of the British, who, to the surprise of many, began increasingly to field talented drivers and independent teams which consistently stole the thunder of the until-then dominant Italians. The British achieved this by racing small teams, put together specifically to engineer Formula 1 cars, and to find the best driving talent. It was a formula which would ultimately be taken over by the larger manufacturing companies - but it worked. Lotus, McLaren, Williams, Tyrrell, Cooper - all of these made a name for themselves on the Grand Prix tracks of the world. However, in 1965, the first Japanese car entered the fray - something which would ultimately change the nature of the sport forever (although, for now, the British continued their 1960s ascent). The 1970s saw a huge revolution in car design, brought about in part due to the innovative ideas about aerodynamics coming out of Japan and the USA. 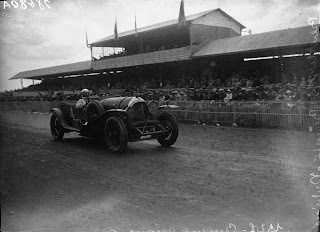 Such vehicles required an inordinate amount of money to design and build - which perhaps accounts for the sudden appearance of sponsors' livery upon racecars. 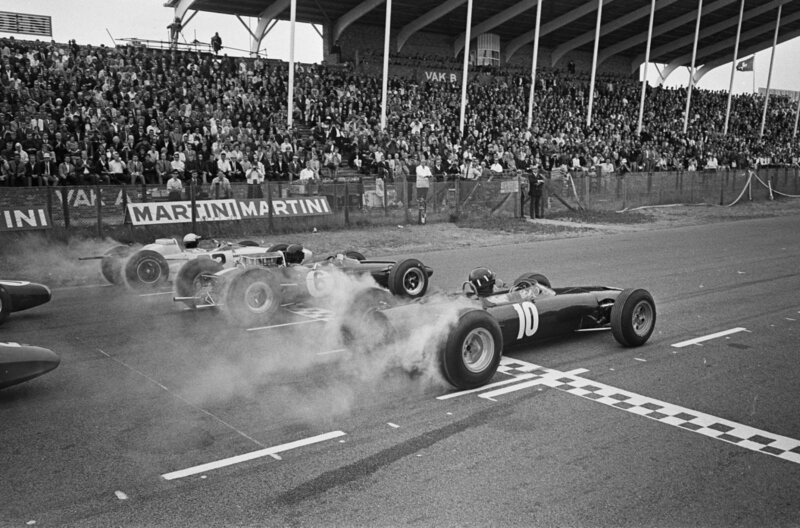 The FIA decided to remove restrictions on sponsorship in 1968, in response to both the pleas of manufacturers and the loss of their own income from automobile companies. Tobacco sellers were quick to offer their financial support - something which would later cause great controversy in the UK. Safety also became a big issue during this era. After drivers boycotted the Belgian Grand Prix in 1969 due to safety concerns, the authorities were forced to look seriously at protecting its drivers. To this end, various safety innovations and track adjustments were brought in - although fatalities and injuries still occurred. Grip became a major concern. Tyrrell experimented with a six-wheeled car (to some acclaim), and debate about four or two wheel drive went back and forth. Ultimately, tyre design seemed to be key to the issue, but it's a tricky engineering problem which continues to inspire and frustrate to this very day!